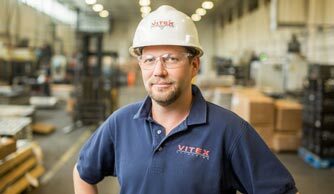 When you work with Vitex, expect consistent quality, shorter lead times, and greater capabilities for your custom extruded aluminum shapes and components. Our employees are committed to the highest standards of quality in all we do - from manufacturing to protecting the environment. Join our team! Learn more about aluminum extrusions design and aluminum manufacturing from our whitepapers, articles and technical guides. We’re continually advancing our capacity and capabilities to meet even the most demanding manufacturing requirements. With state-of-the-art aluminum extrusion systems we produce tighter tolerances, consistent quality and better finishes for your custom extruded aluminum shapes. We provide a wide range of precision CNC machining services to meet your unique aluminum parts requirements. 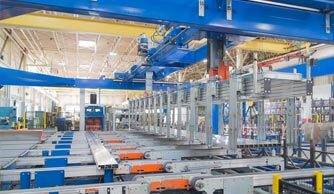 Our long bed CNC equipment can machine aluminum profile sections up to 19 feet in length in one operation, dramatically reducing machining time. We offer a range of fabrication capabilities including precision cutting and mitering to size, milling, drilling, punching, stamping and notching. For aluminum parts and components, we offer surface finishing services, including liquid paint, powder coating and anodizing. We support various partial or finished component assembly, packaging and supply configurations to save you time and money.